THE Pet Shop Boys are set to bring their musical Closer to Heaven to Sydney next year. 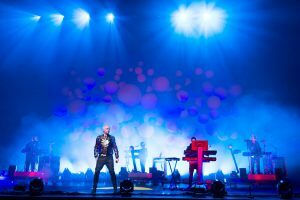 Frontman Neil Tennant says they’re in talks to launch the musical about the time of Mardi Gras 2005, with a possible Pet Shop Boys tour at the same time. But there’s a sticking point. ‘We always feel Australia doesn’t really like the Pet Shop Boys,’ Tennant says. ‘Yeah, f. . . ’em!,’ bandmate Chris Lowe shouts in the background. The duo have just released Pop Art, a two-CD compilation of their singles. And they’re about to start work on their next studio album, possibly with input from Tomcraft. The German dance producer collaborated with the duo on Flamboyant, one of two new songs on Pop Art, as well as the single, Miracles. ‘We’re going more electronic,’ Tennant says. ‘You can hear a bit in Flamboyant. That’s what the next album will be like. Horn worked on the Pet Shop Boys’ single, Left to My Own Devices, in 1988. It’s a move that will excite PSB fans, but Tennant says some of the fans take the band more seriously than the band themselves. ‘Our new theory is they think we’re letting the side down. ‘Chris has this story about when he met fans backstage and they were talking about obscure mixes and Chris didn’t know the answer to their questions. Tennant is also keen to destroy the myth he corrects bad spelling in fan mail. Tennant says the Pet Shop Boys have written a song for Dead or Alive called Jack and Jill Party. ‘There’s a program on UK TV called Diners and you can use your remote to hear a conversation in a restaurant where there are celebrities. Pete Burns (of Dead or Alive) was there, so we chose his table to listen in on. The record should be released this year.